One of Apple’s finest apps is GarageBand, which allows almost anyone to create music using only their Mac or iOS device. Sadly, it’s not available on Android — but Stagelight is. Just like GarageBand, Stagelight makes music creation incredibly simple, with a large collection of virtual instruments, sounds, and loops at your disposal. And don’t worry if you don’t know what you’re doing, because Stagelight’s helpful in-app lessons can teach you. 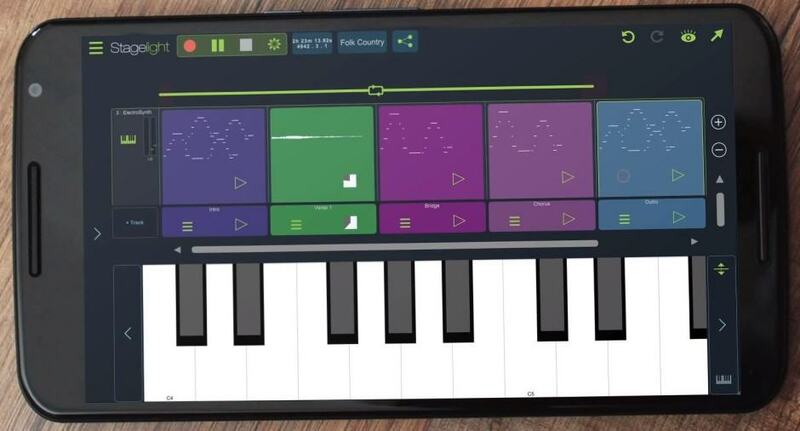 There are lots of things to love about Stagelight, and one of those is its price tag: The app is totally free to download, so anyone can start creating their own music on their Android device. There are in-app purchases to unlock additional content, but you can also unlock more for free. “Stagelight is the first music creation app that allows people to start for free and unlock capabilities as they progress,” explains Cliff Mountain, President and CEO of Open Labs. Aimed at beginners and experts alike, Stagelight promises to be simple to use and incredibly easy to learn, yet powerful enough to allow even experienced musicians to create intricate masterpieces. Its expandable feature set lets you start off slow without it being too overwhelming, then expand your skillset when you’re more comfortable with the app. Stagelight’s step-by-step lessons can teach you the basics of song structure, tempo, how to share your tracks, and more. It’s also packed full of royalty-free content from almost every popular genre, including EDM, hip hop, rock, country, and more. Stagelight is compatible with devices running Android 4.4 and up (and Windows PCs), packing at least a dual-core CPU, 1GB of RAM, and 300MB of available storage. Download it free now!